Christmas draws near, and with all the last-minute preparations, frantic gift-buying (or -making, if you’re the sort to do that), hurried baking, and all those other things that take place in the week leading up to Christmas, the blog has necessarily taken a back seat. It will probably continue to do so till I get back from my parents’ place after Christmas, though I’ll try to at least post a holiday photo Christmas day. That doesn’t mean there’s been nothing going on here, though. We got two dumps of snow over the weekend, starting upon our return from the Christmas Bird Count mentioned in the last posts. It snowed steadily for the rest of the day. Saturday was nice and clear, and then Sunday we got another pile of snow starting early in the morning and then clearing up in the afternoon. We’re forecasted to get some more tomorrow. In between storms this weekend we had visitors stop by for dinner, scratching under the feeders for seed dropped by the multitude of Blue Jays scrabbling atop the platform feeder. 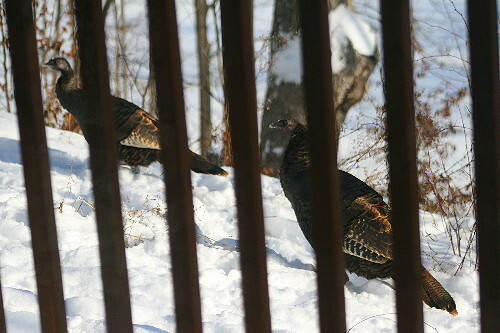 A new species to visit our feeders, appropriate to the holidays – Wild Turkeys. There were nine of them total, although it was hard to get a good count while they were under the feeders because the deck partially obscured the ground there. The way the house is oriented on the available land doesn’t provide a good spot for placing feeders where they’re both easy to see from the big main windows (and from my desk), but also where you can see the ground underneath. Dan first noticed them (I was absorbed in whatever I was working on at my desk) and called my attention to them. A few under the feeders, the rest in the raspberry tangles at the edge of the cliff, all of them too close for good views, I had to look through the deck railings to see them or get photos. There seemed to be a large male, with a pinkish head, and a whole bunch of smaller females, with brown heads. Turkeys travel in small flocks during the winter season, which may or may not be mixed sexes. In the early spring the flocks break up, males establish territories, and the females pick a territory to nest in, resulting in apparent breeding flocks of a male and his harem. Really, though, the females choose the territory that offers the best resources for raising young, and whichever male happens to be defending it ends up (usually) as their mate (younger males who don’t have a territory can always sneak in a quick copulation while the primary male is distracted). I remember reading something back when I was doing the fact-checking for the Wild Turkey account in the Ontario Breeding Bird Atlas (prior to its publication, I was heavily involved in the editing and other aspects of the accounts) that while the females are laying and incubating their brood, they will leave at dawn and dusk (possibly at other times, too?) to forage, and all the hens from the territory will group together in a flock while foraging, then go back to their respective nests. I remember reading that, but it was probably in the Birds of North America account which I don’t have access to anymore. So it may or may not be true. What is true is that once the chicks hatch they and their moms all get together with the other families from the territory and will spend the summer bombing around as one big happy group. This sort of gathering of families and young happens in a number of species, mostly gallinaceous species (grouse, chicken, and other game birds) or waterfowl. It allows for greater protection against predators – more eyes, and reduces the chance of any one individual chick being picked off, the whole safety in numbers thing. Families will often stay together right through the winter, only breaking up in the spring when the females go off to find a territory to nest in, and the young males will try to find a territory to defend. It’s hard to say whether the group we had under our feeder was therefore a group of adults, or a female with her young from that year (although they can hatch up to a dozen chicks, the youngsters suffer a high mortality rate during their first couple of weeks, while they are flightless and at risk from predators and ugly weather). The male didn’t seem to have the fully formed wattles of a nice big adult, so it’s probable he was a young-of-the-year, a chick from the summer. The adult males get strikingly bold head colouration, particularly during the breeding season. They also have fleshy growths above and below their bill, called caruncles. When the males are strutting their stuff the growths become engorged with blood and long and firm (which also calls to mind another familiar species that does the same thing…). Male turkeys can change the colour of their head, as well, from their normal pink to blue or white when excited or aroused. Interestingly, the red wattles under a male’s chin (which don’t change colour) grow throughout his life, starting out about two inches (5 cm) and averaging about 4 inches (10 cm) per year after that. Turkeys live on average two to three years (though it’s possible for them to live longer) so older males will have wattles 10 or more inches (25 cm) long. I think that confirms the male as a youngster. 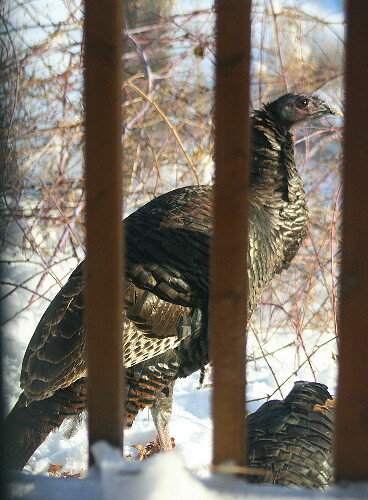 Wild Turkeys are the largest game bird in North America. There are only two species of turkey, the other one being the Oscillated Turkey of South America, a gorgeously iridescent bird (you really have to click that link and see it to believe it). 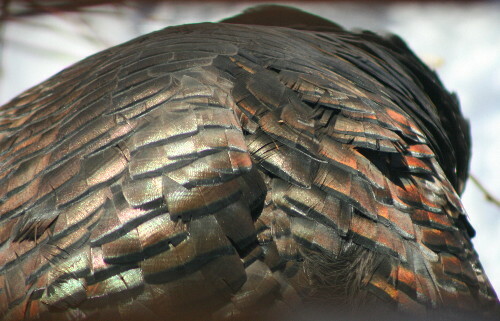 Our North American turkeys are iridescent, too, it’s just that compared to their southern cousins theirs is a much more subdued glamour. Now and then, when they turn, their feathers will catch the light just so, and you’ll get a quick glimpse of this oil-slick gleam. The previous photo is of the bird’s tertials, the flight feathers closest to the body on the wing, with a greenish sheen. These are body feathers, and have a redder bronzy hue. 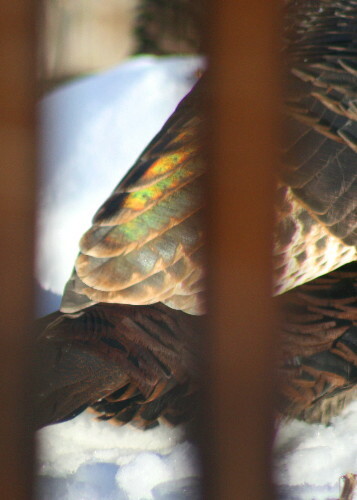 Both the males and the females have these beautiful iridescent feathers. Then their tails are a rich rusty red, and their outer wing feathers are pale and barred. They may not be as striking as the peacock, but turkeys really are pretty gorgeous birds. If you can get past the head. 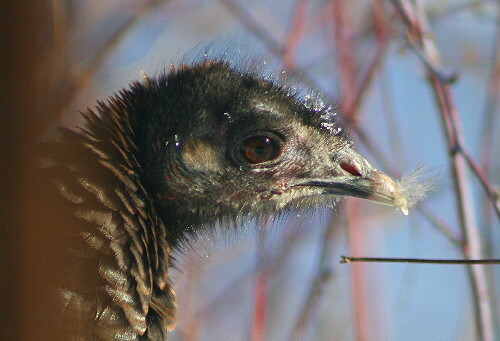 Most birds with featherless heads are like that because they’re routinely sticking their head in places where the feathers are likely to get all gooey or messy – like a roadkill carcass, in the case of Turkey Vultures, who incidentally get their name from their superficial resemblance to the ground fowl. Turkeys are omnivorous, eating a wide variety of foodstuffs, from the seeds under our birdfeeders, to berries on low-growing shrubs, to acorns and other nuts in the forest, grasses and leaf buds, insects, spiders, millipedes, snails, even frogs and salamanders if they can catch them. In the summer they take high protein foods like insects while raising their young, in the winter they take what they can get. A bare head doesn’t serve the same function for them that it does for vultures, instead is useful, at least in males, for its bright colours and the ability to change colour according to situation. The featherless heads of females is just a byproduct. 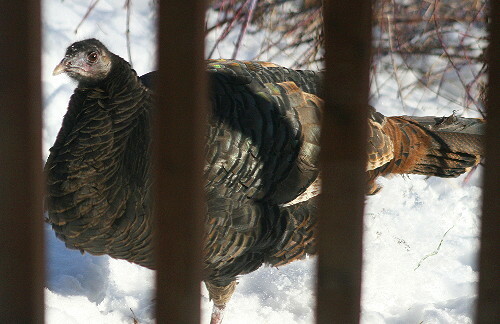 Prior to the arrival of settlers, turkeys were common throughout the forests of the east. Its numbers plummeted in the 1800s due to overhunting (as we know, turkey makes an excellent dinner) and habitat loss as land was cleared for agriculture. Things got so bad, in fact, that the species disappeared from Ontario altogether by 1909. For 75 years there were almost no turkeys in Ontario. The Ontario Breeding Bird Atlas, which censused the birds of Ontario from 1981-1985, records turkeys in just 19 squares. Then in 1984 the Ontario Ministry of Natural Resources began a reintroduction program that started with 74 birds taken from Michigan and Missouri and released into the forests of southern Ontario (it may be some of these birds were the ones recorded among those 19 squares). 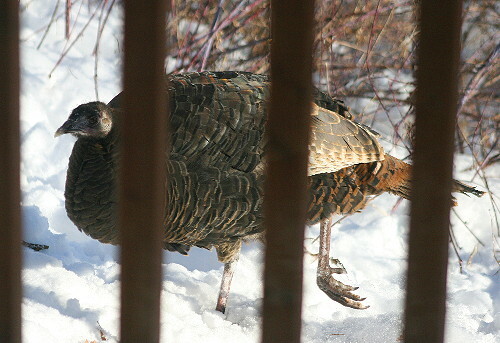 Turkeys have continued to be taken from high-density populations and released into Ontario since then, and now the species is found through virtually all of southern Ontario south of the Canadian Shield (and even some locations on the Shield). It is now found in 911 squares. The provincial population is estimated at over 100,000 individuals. In some, particularly in the north, these populations are sustained through continued release of captive-raised or transplanted birds. 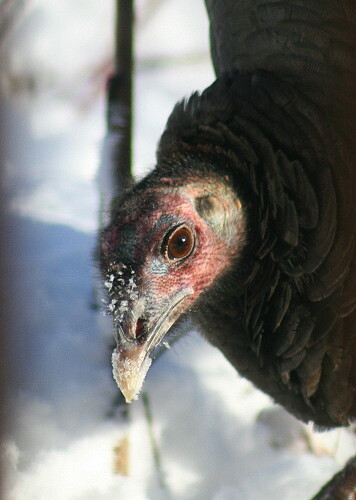 The survival of Wild Turkeys is largely dictated by amount of snowfall. In areas where ground snow exceeds 25 cm (10 inches) for extended periods (more than seven consecutive weeks) the birds cannot forage well enough to sustain their diet and most will eventually starve. Some northern populations may also be able to survive by regularly visiting feeders when the snow gets too deep. I doubt that we’ll see that sort of snow cover persist throughout the winter, but we’ll keep our feeders stocked just in case, and I’ll hope to see them again. Thanks for your great informative post. This is a very informative post on turkeys which I thank you for sharing. We have wild turkeys in California, in hilly lowland areas. I have a friend who told me of driving along his rural road one night and hitting a turkey with his truck, the day before Thanksgiving. So he had wild turkey for dinner that year.